1. You get a SOLID valve that has been proven over the last 10-years! 2. You get a 2-YEAR WARRANTY (that you will probably never need). 3. You'll have access to rebuild parts that are in stock and ready to ship, IF, you ever need them. 4. You get FREE PRIORITY SHIPPING, as long as you are in the United States. 5. You get an LED indicator built right into the solenoid plug for aiding in troubleshooting. We’re so confident in our product that we will give you a 2-YR warranty against defects and we do stock all parts that can go out after many years of use and abuse, so you don’t have to buy new valves. Whether you want a nice smooth ride or want to crank up the nitrogen bottle to these bad boys, you will not be disappointed! In fact, we are so sure that you will be more than satisfied with our valves, that we will give you this GUARANTEE: If you are not 100% satisfied, (please excuse us for sounding like an infomercial) simply call us for an RA# and return the valves in a “resell-able” condition for a full store credit*. PUT 8 OR MORE IN YOUR CART AND GET 10% off!!! *customer is responsible for ALL shipping charges and insurance. All brass valves are not created equal... BUYER BEWARE!!! The air ride market is currently flooded with these inferior valves pictured below. They run anywhere from $15-$45 each for the same exact valve that's made from multiple China factories. But they only work for so long until they start leaking internally. Basically, it's what's on the inside that counts! These are basically a "disposable" air valve. They also have a very high wattage coil that is NOT COMPATIBLE with our AVS switch boxes and they keep causing us headaches. If you are going to run these large round solenoid valves with one of our AVS switch boxes, you will need to run a 30-amp Bosch style relay on each output of the switch box. Otherwise the high amperage that these valves draw will slowly damage and/or cause build-up on the switch/relay contacts, burn up traces, fuses, and more. You will also have problems when you use the FRONT/REAR/ALL UP/DOWN switches since the current draw is even greater while trying to activate multiple valves at once. Email us for a relay wiring diagram if you need one (but hopefully you'll just stay away from these valves). 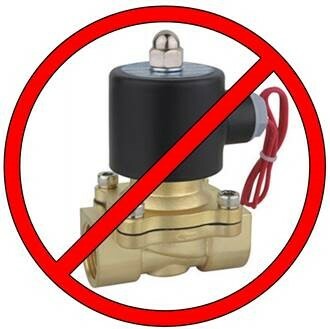 We are not trying to compete with these cheap knockoff valves, so it is very important to us that we warn you. We want you to spend your money wisely, keep your sanity, and have a trouble-free air ride system. So please do yourselves a favor and stay clear of the valves in the pic below!!! You would be much better off with a DANZ, PARKER, SMC, GC or ASCO valve (which we don't even sell, so why would we lie to you?). You work hard for your money - DON'T BUY JUNK!!! Good parts aren't cheap, and cheap parts aren't good! Two years warranty against defects. Click the button below to add the AVS 250 PSI 1/2" VALVE WITH MOUNTING BRACKET BLACK to your wish list.